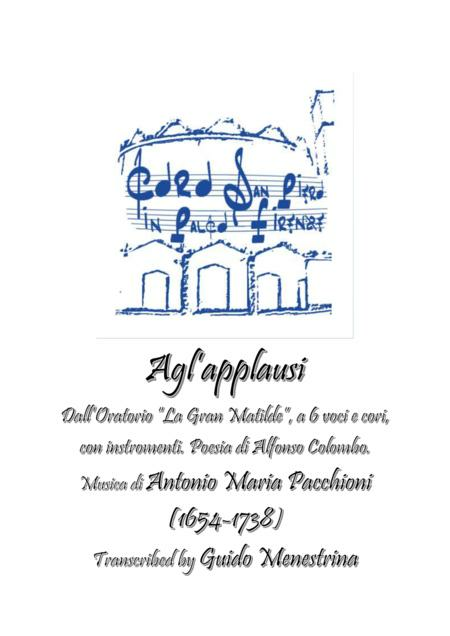 Composed by Antonio Maria Pacchioni. Arranged by Guido Menestrina. Baroque Period, Sacred. Score, Set of Parts. 14 pages. Published by Guido Menestrina (S0.91929). 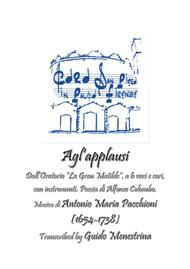 From A.M.Pacchioni's oratorio "La Gran Matilda" (1682)Transcribed by Guido MenestrinaIncludes - full score- strings score- choir scoreYou can follow the score online on youtube: https://www.youtube.com/watch?v=eAwpaN-r82w or listen to it on soundcloud: https://soundcloud.com/guido-menestrina/antonio-maria-pacchioni-agli-applausi-alle-vittorie.